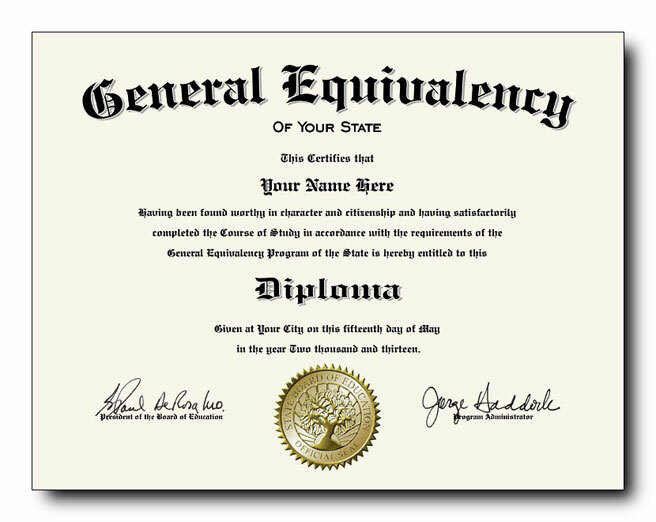 All GED diplomas come with our State Board of Education embossed gold foil diploma seal. REMINDER: Your diploma will be made in our State Issued style GED diploma template with the information you provide below. REMINDER: Your diploma will be made using our School Issued style GED diploma template with the information you provide below. We need the name and address of the TESTING CENTER or SCHOOL where you took your exam. DO NOT LIST YOUR NAME HERE. The testing center MUST be located in the same State that your diploma was issued in. I understand that my transcript will NOT have a signature on it. These are #10 business size white security envelopes that are stamped "UNOFFICIAL IF OPENED" on the back. The front side will be left blank. I understand my diploma will be printed on 8.5" x 11" ivory colored heavyweight paper, will have 2 signatures (or blank signature lines) and will come with the State Board of Education embossed gold foil seal shown on your website. I understand I am not purchasing a replica document and that my diploma will be prepared in the format shown on your website. 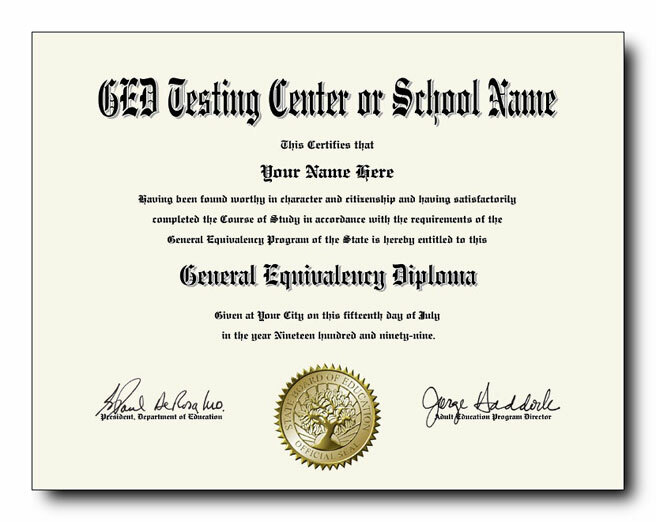 I understand that your State Issued style GED diploma does NOT list a school or testing center name on it. I understand my diploma will be printed on 8.5" x 11" ivory colored heavyweight paper, will have 2 signatures (or blank signature lines) and will come with the State Board of Education embossed gold foil seal shown on your website. I understand I am not purchasing a replica document and that my diploma will be prepared in the format shown on your website. I understand my transcript will be printed on pale blue security paper. I understand that the backside of the transcript will be blank. I understand I am not purchasing a replica document and that my transcript will be prepared in the format shown on your website. I understand that your transcripts do not come "sealed". I have clicked on the link above and have read and agree to all Terms & Conditions. I declare that I have checked the laws where I live and I am not prohibited from purchasing or possessing a novelty diploma or transcript. I understand that the novelty diploma and transcript have no academic value, and I attest I will not use the novelty diploma or transcript for illegal purposes of any kind.